HerbDoc plays host to a robin family! 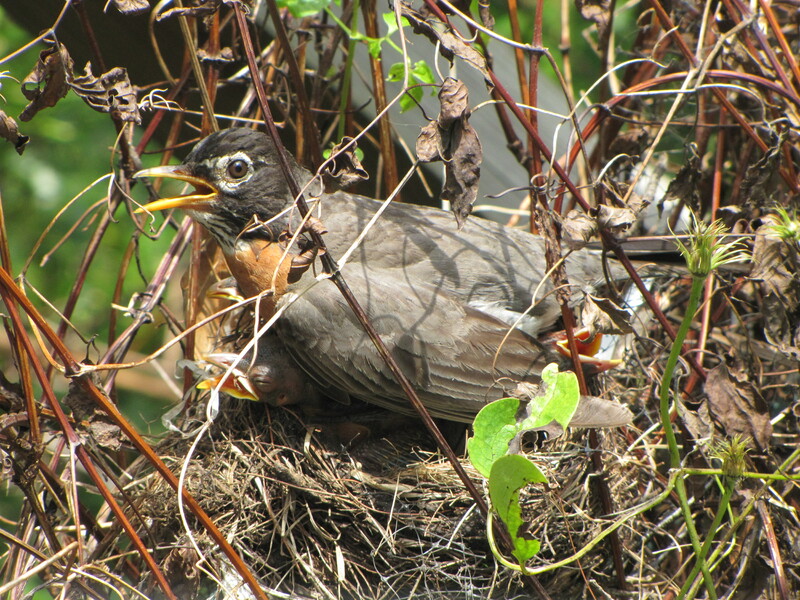 It was only a common robin (Turdus migratorius) that built her nest in my clematis trellis, but I learned so much about bird behavior from her. About five weeks ago, I noticed a pair on robins flying under my deck and from an upstairs window, finally spotted the 5 inch round nest taking shape. Patiently they added twigs, paper, feathers and coarse grass to their nest, lining the outside with mud and the inside with soft grass clippings. About four weeks ago she laid three blue eggs which took 10 days to hatch. The nestlings were naked and blind and received constant care from their mother. I watched as she fed them soft caterpillars, grubs and worms. When it was very hot, she would take a trip to the bird bath in my herb garden and submerge herself in the cooling water for several minutes. Then she would return to the nest, sitting on top of the trellis with her nest a few inches below and spread her wings. Amazing! She was shading and cooling the tiny nestlings from the intense sun and summer heat. They have developed quickly and are now covered with feathers and are almost as large as their mother. They’re pretty crammed into that little space, and movement has to be restricted or a sibling might fall out. Their mother only visits to feed them and spend the night. She’s not ever far away, however, as she swoops and chases any bird or animal in the vicinity that she feels is a threat. I understand it only takes two weeks from hatch for them to be able to fly and leave the nest. 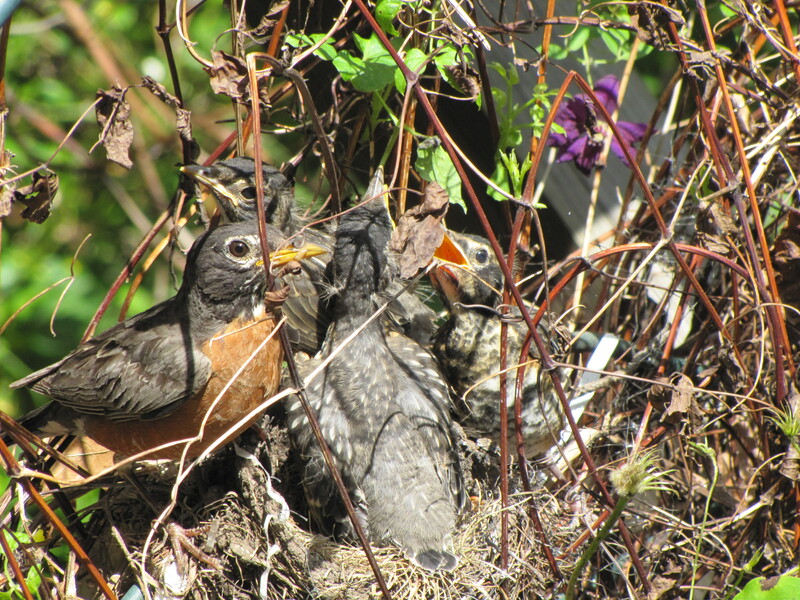 Even though my clematis has suffered from the constant comings and goings of Mom Robin, I will miss watching this little family group. Fab photos. Last year Mourning Dove built a nest and hatched eggs in our clematis on our 2nd floor balcony. The nest was within 4 feet of our balcony door but Mourning mother was unflustered by our observing from inside. Chapter 2: This Spring a robin built a nest and its behavior was remarkably different – highly skittish. Robin mother became quite distressed if she spotted us inside – even 5 feet beyond the glass door. The slightest movement would set her off and yes, she would squawk and take flight. Feeling compassion for a mother’s plight, we gave her a break and avoided the door for a few days. Another natural event to remind us of every day miracles. Thanks for posting this, prompted me to reminisce how much we enjoyed it all. I always get excited when I am afforded a glimpse of nature, and I am especially fascinated by birds/ nests. Lucky you! wow, how wonderful that you got to watch this. My sister had a nest next to her kitchen window. I visited for a few days and we were nervous wrecks, constantly checking on them to see things were going ok. I always love watching birds, especially when I’m lucky to get a glimpse of them when they’re nesting. And it’s so cute the way the mother shades her babies! Glad you enjoyed the photos! Not only did Mom Robin shade her babies from the glaring sun and heat, she was also their umbrella when it rained. Absolutely amazing behavior!